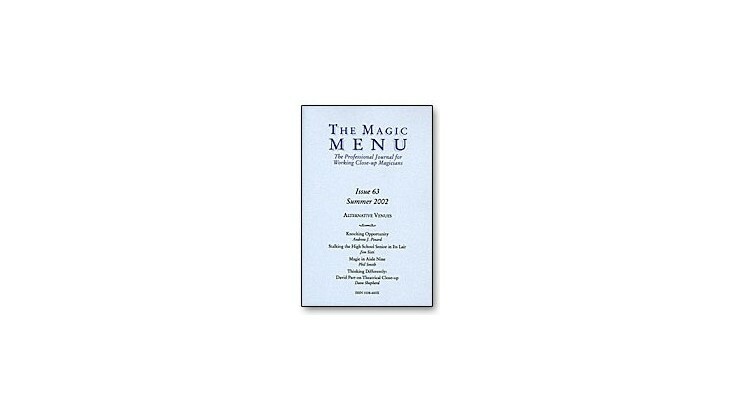 For over ten years, Jim Sisti's The Magic Menu has held a unique position in magic as a consistent, reliable source of information for working professional restaurant and bar magicians, written by working professionals. Issue 63 focuses on Alternative Venues for the close-up performer. High school graduation/post-prom parties are examined by editor Jim Sisti as are supermarket promotions by Phil Smith. 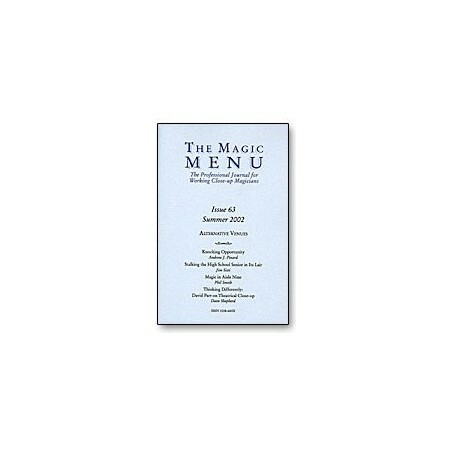 Co-editor Andrew J. Pinard takes a look at how your approach can effect the way others view magic and magicians and staff writer Dave Shepherd interviews magician and "deep thinker" David Parr about theatricality in close-up magic. Also in this issue, regular columnists Paul Green, Richard Robinson, Eric Henning and David Acer are rejoined by Andrew Pinard with his "Nuts & Bolts" column, where he tackles the often-controversial topic of performing fees. Mark Zacharia reviews the School for Scoundrel's "Street Shells" and Harvey Berg's "Final Exam."